This is the site of a brick works, which is known to have been active until 1937, referred to as Dove Yard. It had Hoffman kilns and a tall chimney on legs. When it was felled the Tusting Close road was laid out by running a steam roller over the fallen stack. Hoffman kilns: tall chimney on legs was felled and the road of Tusting Close was laid out by running a steam roller over the fallen stack. Known as Dove Yard. Information from former owner to E. Rose 3 November 1977. Another modern street on site called Dovedales. Brick kilns here marked on map of 1836 (S1) and on map of 1883 (S2), but only at north end of site as marked on NHER. Compiled by E. Rose (NLA), 21 August 2000. This is probably the yard (or perhaps less probably NHER 35618) owned by Ruymps and closed in 1937, of which a photograph is shown in (S1). E. Rose (NLA), 22 January 2002. Site actually owned by Cunnell and Co from 1900 to around 1930 according to site owner Mr. Tusting and consisted of brickyard, claypit and tramway. The above suggestion is actually NHER12926 at Old Catton. --- Unpublished document: Best, G.. 2000. 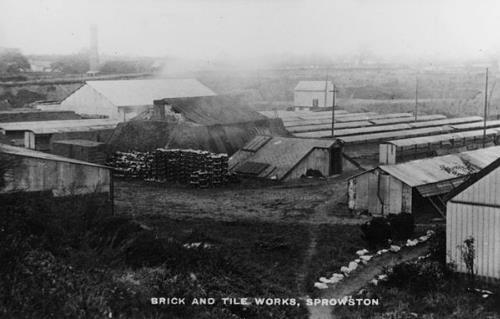 History of Sprowston..
<S2> Map: Ordnance Survey. 1883. 25 inch 1st edition. OS. <S3> Archive: NIAS. Norfolk Industrial Archaeology Society Records.